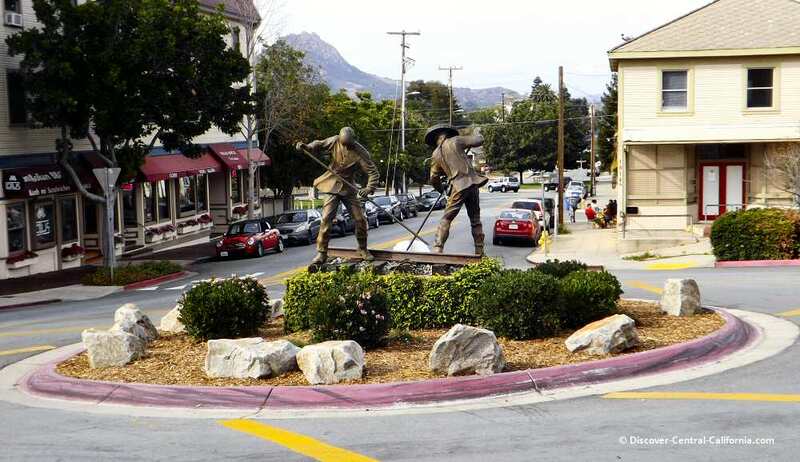 The Iron Road Pioneers sculpture stands in the traffic circle at the confluence of Railroad Avenue and Osos Street in San Luis Obispo right near the Amtrak station. 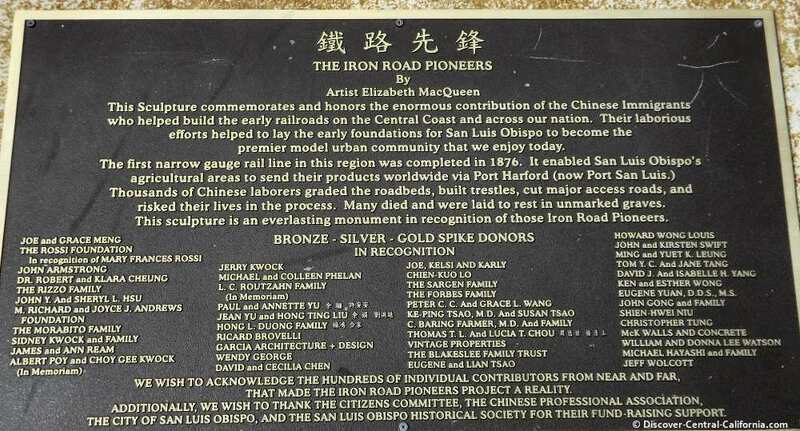 It commemorates the heretofore unsung work of Chinese immigrants in building the railways both here in Central California and throughout the West. A previous Photo of the Week selection. 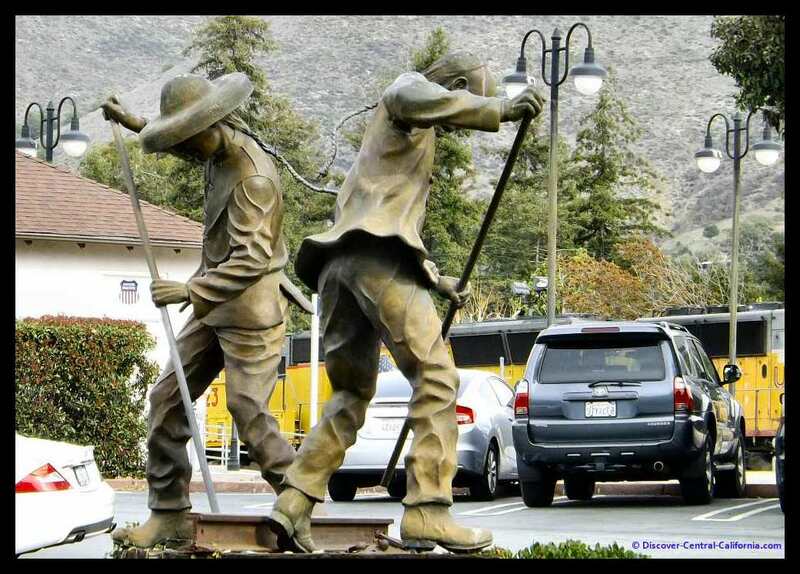 Full of movement and animation, the Iron Road Pioneers is worth a visit if you happen to be in San Luis Obispo. 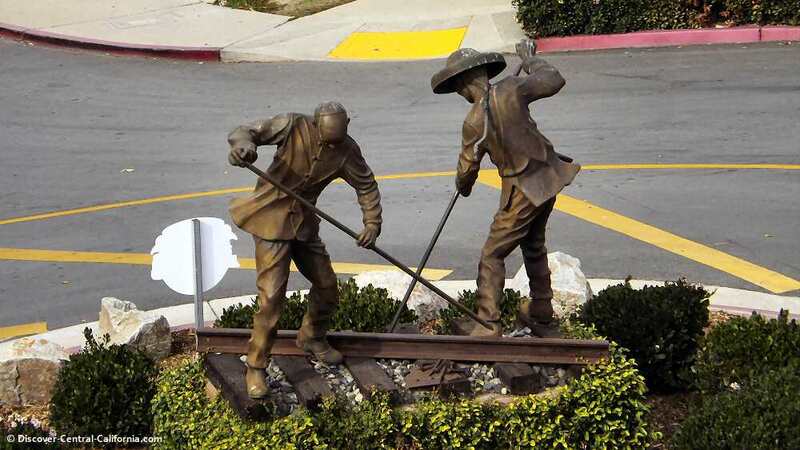 A bit larger than life bronze sculpture done by Elizabeth MacQueen, this work is so vivid that you can almost hear the sounds of hammers driving spikes or the clanging of iron rods hitting the rails to move them into position. 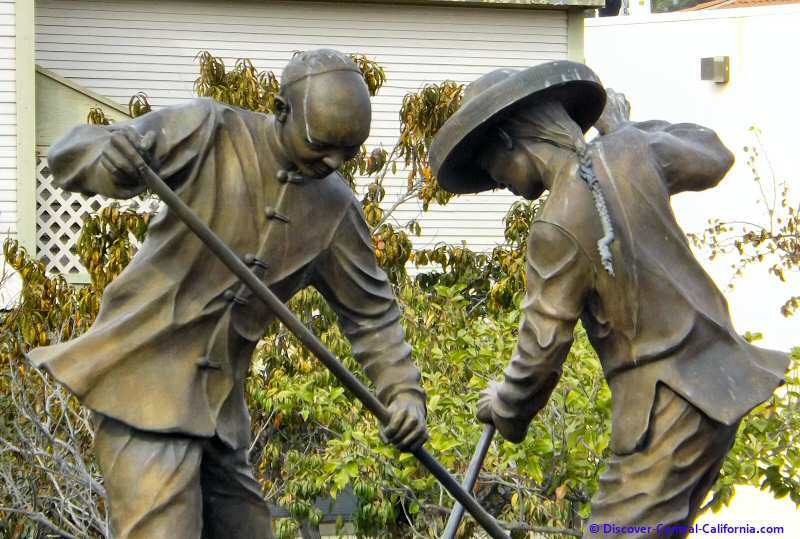 This sculpture memorializes the work done by thousands of Chinese immigrants during the late nineteenth and early twentieth centuries throughout the West. 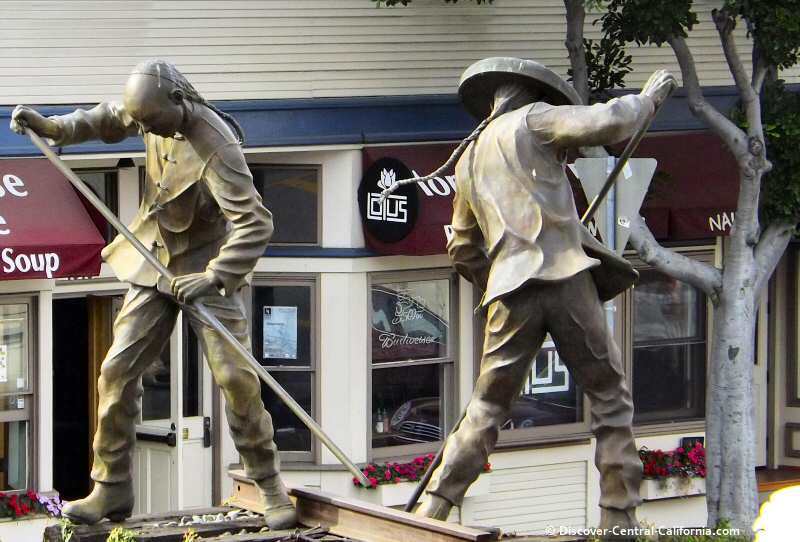 A view of the sculpture toward the northwest. Cerro San Luis Obispo (the large hill) is visible in the distance. Cerro San Luis is one of the Nine Sisters that ends at Morro Rock. Between there and sculpture is Triangle Park. Another view with the pedestrian bridge on the right which crosses over the train tracks. 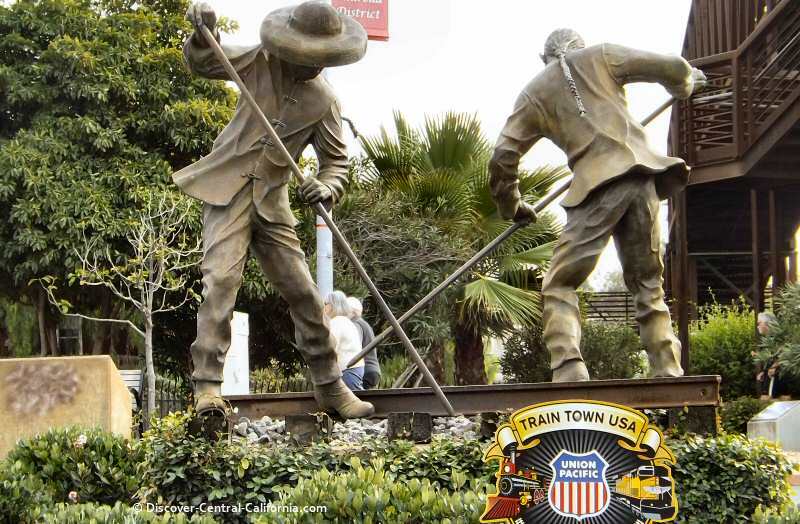 The "Train Town USA" plaque commemorates the Union Pacific's 150th anniversary and its relationship with particular towns across the country. The pedestrian bridge affords a good view of this sculpture as well as the Amtrak station and the tracks bending away into the distance. From this view you can see the railroad ties sitting in the gravel bed, the rail being moved into position as well as the nails waiting to anchor the rail. There are a number of very good restaurants in the area, not the least of which is Cafe Roma, one of our favorites. Long before we moved to the area we happened upon this restaurant and it has remained one of the best in town.